As 2018 draws to a close, we send heartfelt thanks for your ongoing support of Tzedek DC’s mission and work. It’s also a good time to reflect on why Tzedek DC was launched in the first place, less than two years ago, and to catch you up on our past few months. 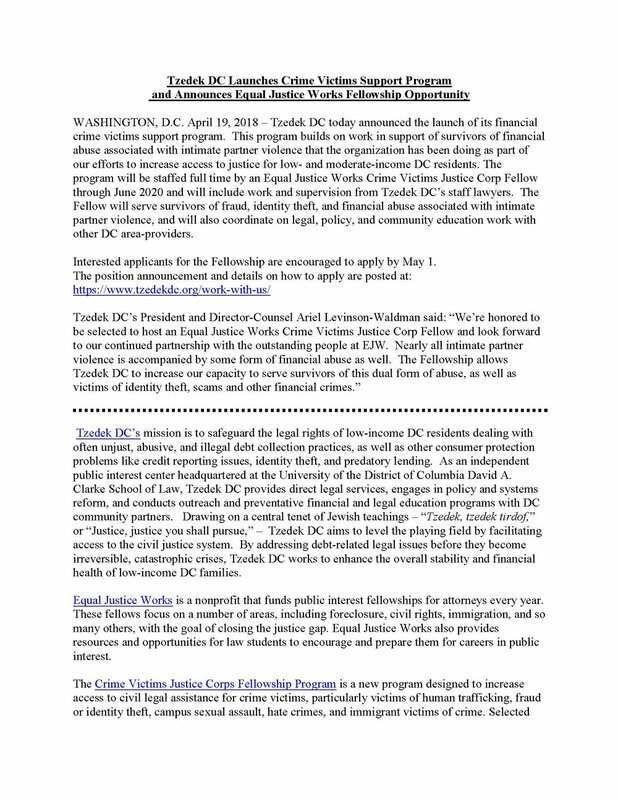 Tzedek DC was established because a high percentage of low-income DC residents, notably in our communities of color, experience formidable problems with debt and debt collectors. However these residents neither get nor in many cases are given a meaningful opportunity to seek the legal help that could resolve or mitigate those problems. Tzedek DC opened our doors in February 2017 as the first and only organization to focus principally on this issue, with a three-part game plan to prevent debt, court judgments and credit report harms from setting off catastrophic financial, housing, employment and family crises for some of our most vulnerable neighbors. Second, through our partnerships for community education and outreach, we co-lead preventative and practical education regarding debt, credit, economic fraud and consumers’ rights. This year, we added several new partners – Little Lights Urban Ministries, the DC Metropolitan Police Department’s Office of Neighborhood Safety and Engagement, the Victim Legal Network of DC, and East of the River Casehandlers among others – to provide their clients and staff with help on debt management, credit repair and reporting, and pre-bankruptcy issues. Third, we engage in policy and systems reform work to make existing DC laws and practices fairer. Our advocacy, in partnership with the Jewish Community Relations Council of Greater Washington and a strong coalition of anti-poverty groups, paid off spectacularly in 2018. First, the DC Council ended the automatic suspension of drivers licenses for those unable to pay their traffic debt. Second, the Council voted to end drivers license suspensions for unpaid court debts. Third, and just this week, on December 18, the DC Council passed the wage garnishment reforms that our coalition has been pushing for the past year: making the garnishment rules much less onerous for the city’s lowest income earners, protecting earnings up to DC’s minimum wage from garnishment, and for the first time requiring notice before a person’s wages can be garnished. In January, we’ll be moving into renovated offices at UDC’s David A. Clarke Law School, where we are proudly headquartered, from where we will aim to serve more clients, grow our roster of community partners, and further pursue systemic reforms. It will be a lively space and we welcome visitors and volunteers. Unfortunately, the needs that Tzedek DC was originally created to address show no signs of abating and, in fact, are continuing to increase. We seek your continued support, to enable still more progress on our mandate of helping low-income families facing debt and debt collection abuses. Please make as generous a year-end gift as you can – click on https://www.tzedekdc.org/donate-now/ – share our work with others in your circle, follow us on social media, and help us continue to send the message that we are all in this together. With gratitude, and wishes for a good holiday season. Again, we deeply appreciate your support of Tzedek DC’s work. Provided free legal help to over 430 clients, more than half of whom are women of color. Saved clients an average of $1,046+ per case in our full representation cases, which is more than two weeks-worth of wages. Delivered Know Your Rights trainings and financial literacy materials to thousands of DC families and UDC Community College students. Co-led a coalition that recently achieved a big win for systemic reform: the DC Council just voted to end the DMV’s automatic suspension of DC drivers’ licenses for failure to pay traffic debt. 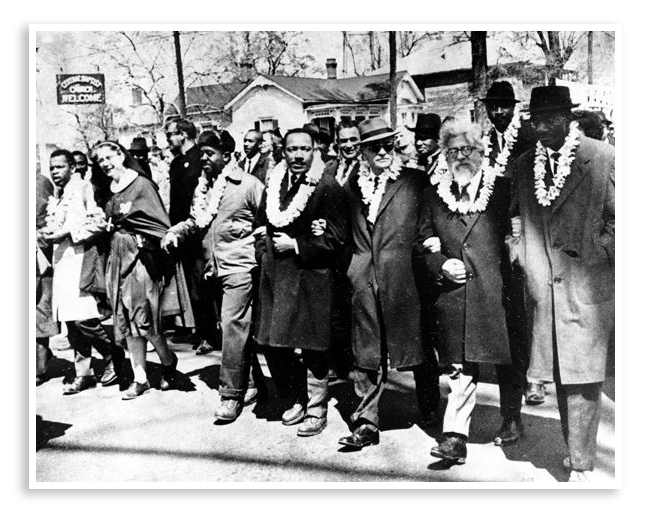 This work was done in terrific partnership with the Jewish Community Relations Council of Greater Washington (JCRC) and an interfaith coalition of leading civil rights, anti-poverty, and legal services organizations. 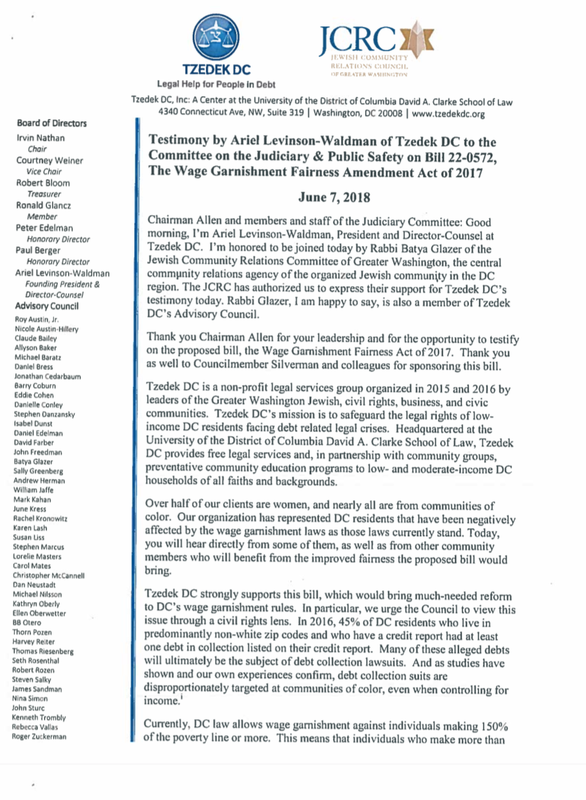 We have also definitely increased the number of DC residents who know how to pronounce “Tzedek” and appreciate that our name is from a term in the Torah and refers to justice! As a result of our work, we are both building bridges and increasing access to the justice system for hundreds of low-income, unrepresented DC residents who tell us that now, often for the first time, they feel the legal system is finally working for them. We are deeply grateful for the growing recognition of our work from supporters old and new, D.C.’s legal community, and commentators. At the same time, we are ever mindful of the continuing attacks on our most vulnerable neighbors from federal policy, including attacks on our immigrant households and the evisceration of the Consumer Financial Protection Bureau and other consumer safeguards -- a set of assaults that makes our work especially timely and essential, and reinforces our determination. For a deeper dive, just keep on reading – or scroll down here and click (on non-mobile devices) on the links to specific topics. And we hope to see you on September 17 at Eat Well, Do Justice 2018! Battle of the Blintzes, details here so that we can celebrate this work together. Clients served & money saved. In our first year and a half, Tzedek DC has provided free legal help to over 430 families. We are saving our clients about $1,046 per “full representation” case, representing about two weeks of wages (at the new minimum wage of $13.25 per hour). We are also saving our client families attorneys’ fees (often sought through fee-shifting demands by plaintiffs in debt cases), longer-term costs, and future problems avoided by not receiving an adverse judgment. Our Clients Send Their Relatives to Us for Help. As of last month, our past and current clients represent the single largest source of referrals (over 1/3) of new clients. This is something we are both proud of and, we believe, highlights the possibility of spurring the long-term paradigm change we seek in the delivery of legal services for debt as, over time, access to help becomes the norm rather than the rare and lucky exception it has been. Sample Case in focus. Erica Folds is a single, unemployed 28-year-old mother with a daughter, who receives public assistance. Her partner became physically, verbally, and financially abusive. As part of the financial abuse, he opened credit cards in her name while they were together. After she fled, he filed income taxes in her name (a common tactic by abusive partners to fraudulently receive income tax refunds). In response, Ms. Folds filed a joint complaint to the IRS and the Federal Trade Commission. But after learning she was still being sued by a third-party debt collector for $924 on a Wal-Mart card her ex-partner had opened in her name, she planned to pay -- just so she could put the conflict behind her. Tzedek DC took on Erica’s case and obtained dismissal of the debt collector’s suit against her, allowing her to get back on the path towards stability. Our First Equal Justice Works Fellow. Sarah Hollender, our fantastic Associate Director of Litigation, and I were joined last month by our third full-time lawyer, Bianca Smith -- thanks to a prestigious, two-year $128,000 grant award from the Equal Justice Works Crime Victims Justice Corps Legal Fellowship program. Bianca’s focus is on assisting and empowering victims dealing with all forms of economic exploitation and fraud, from identify theft and imposter scams, to exploitation by lenders and debt buyers. Bianca comes to Tzedek DC as a 2017 graduate of Catholic University Columbus School of Law, where she was Executive Director of the Black Law Students Association, and after completing a judicial clerkship as well as internships with the U.S. Capitol Police and a public defender’s office. Our Pro Bono Volunteers. Our pro bono attorney partners are indispensable allies in handling our caseload. This growing cadre now boasts over sixty members, and includes a retired appellate judge, along with lawyers from large and small law firms, federal agencies, and in-house corporate offices of general counsel, collectively ranging in age from their twenties through their seventies. We’re grateful to the law firms of Venable, Steptoe, and King & Spalding, each of which has hosted (and fed!) our pro bono volunteers at training sessions. We encourage all of you lawyers reading this to consider getting trained to take on cases, and non-lawyer friends to reach out to us about other volunteer opportunities to get involved! Building on our initial partnerships with UDC, United Planning Organization and Little Lights Urban Ministries, we are also continually taking advantage of connections -- typically made through our Board members, funders and colleagues -- to build productive new working relationships. Know Your Rights Trainings. We have also continued to seek out additional venues for offering preventative trainings in familiar community settings, along with distribution of our English and Spanish educational materials -- with respect to financial literacy, credit, debt collectors and lawsuits, the importance and availability of legal counsel, and citizens’ rights. These efforts will grow the pool of people over time who are aware of and comfortable seeking legal help. For example, residents at the Potomac Gardens Public Housing Complex recently attended a credit repair and Know Your Rights training we did in partnership with Little Lights Urban Ministries. Tzedek DC has been the lead organization for ending the DMV’s constitutionally dubious and patently unfair practice of automatically suspending DC drivers’ licenses for unpaid traffic debt, with no inquiry regarding the ability to pay. The DMV suspended over 126,000 licenses on these grounds since just 2010. A version of the bill we drafted targeting ticket-based suspensions was passed unanimously by the full Council on July 10 and is awaiting the Mayor’s signature. Our coalition advocacy letter is here. A Washington Post article on this reform includes quotes from Tzedek DC and is here. A second bill with a related proposal we put forth – to end the suspension of drivers’ licenses for court-based debt (debt arising from court judgments that favor insurance companies in certain automobile-related cases) – was considered by the Council’s Transportation Committee at a July 6 hearing. Tzedek DC’s client Billy Peterson -- a senior citizen, Ward 5 resident and U.S. military veteran -- testified about an insurance company’s threats to coerce him into making payments. Tzedek DC Senior Advisor Janet Lowenthal read into the record a letter from another client of ours. And we as an organization, alongside our partner the Jewish Community Relations of Greater Washington, testified on the legal, equity, and policy reasons compelling this reform. At the end of the hearing, the DC Government Executive branch witness announced that she had no objections to the proposal. Committee Chair Councilmember Cheh announced her intention to move forward with the reform. In coalition with other DC legal service providers, we are also supporting a bill that would update the District’s wage garnishment law, which currently authorizes up to 25% of wages to be garnished for even those who make barely more than minimum income. The bill proposes using a practical, straightforward calculation tied to the District’s minimum wage, to make garnishment limits more protective of low-wage workers’ earnings, and would also require creditors to give prior written notice to affected employees, before a garnishment order could go into effect. This bill received a hearing on June 7, 2018 from the Council’s Judiciary Committee –where Tzedek DC testified along with our client Cecile Tshibuabua. DC Council Judiciary Committee Chair Charles Allen has publicly indicated his intent to move forward with the bill. Our progress over the past months rests heavily on the support of all who have volunteered their time, and all those institutions and individuals who have contributed financially. In May, Tzedek DC was deemed by the Catalogue for Philanthropy as “one of the best,” and selected for inclusion by the Catalogue for a four-year listing that will provide recurring support for our work through 2021. In another form of recognition, Tzedek DC has been asked by the DC Superior Court to serve on the Small Claims Committee as one of two legal service provider members. This involves meeting with judges and staff from Superior Court to discuss ways of improving the Court’s processes, forms and procedures, such as identifying ways to reduce wait times for our client community, which can significantly increase both parking costs and time missed from work. The impact of our work has also been recognized in articles, interviews, or postings by the Washington Post, Huffington Post, National Review, Washington Jewish Week, Kol Ha Birah, the Forward, the Jewish Council for Public Affairs, WPFW Pacifica Radio Jazz & Justice, and Sound Advice, where Dean Shelley Broderick of the UDC David A. Clarke School of Law interviewed me and Tzedek DC Advisory Council member and pro bono counsel Danielle Conley on drivers license suspension reforms. Eat Well, Do Justice 2018! 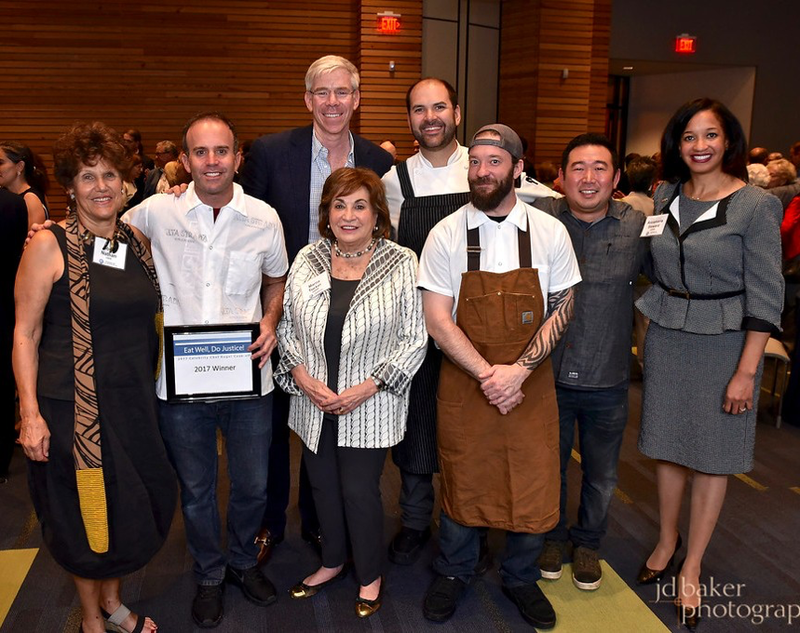 On September 17, top DC chefs will donate their finest creations of the traditional staple, blintzes. Guest Judges include Karl Racine, Attorney General of the District of Columbia, Marcia Greenberger, co-founder, National Women's Law Center, Ruth Marcus of The Washington Post Editorial Page, and Alex Levin, Eat Well, Do Justice! winner 2017, Schlow Restaurant Group. Tzedek DC Testifies to DC Council, Urging Legislation to End the Automatic Suspension of Low-Income DC Residents' Drivers Licenses for Nonpayment of Debt. Washington, D.C., August 16, 2017– Tzedek DC, the Virginia NAACP, and coalition partners today submitted an amicus brief in a case in the U.S. Court of Appeals for the Fourth Circuit arising out of the dismissal by the lower court of a class action complaint filed on behalf of over 900,000 Virginians whose drivers’ licenses were suspended. Virginia, like the District of Columbia – where Tzedek DC’s legal and ongoing policy reform work on behalf of low-income DC residents with debt related issues is focused – currently suspends driver’s licenses when traffic tickets and court debt are unpaid, without any inquiry into the ability of the person with the driver’s license to pay traffic-related debts and the often accompanying late fees and penalties. The brief details how, for many, the loss of a driver’s license means “a loss of a reliable way of meeting one’s basic needs such as transporting oneself or family members to work, to critical medical appointments, taking children to school and shopping for food.” It argues that the automatic suspension of driver’s licenses in Virginia for non-payment of debt both has a disparate impact on African-Americans and violates the Constitution’s due process and equal protection principles. Tzedek DC in its first seven months of operations has, along with financial literacy work and legal work representing over 70 individuals being sued or threatened in debt cases, filed coalition amicus briefs to the U.S. Supreme Court, DC Circuit, and now the Fourth Circuit, related to debt and consumer issues.